A new reader, Toni of Undertones-Artgypsy has tagged me with the middle name game. I'm not a stickler for rules so I'll just go with the basic one: list one fact about yourself for each letter of your middle name. Each fact must begin with that letter. If you don't have a middle name, just use your maiden name. I'm supposed to then tag four people, but I'm not as good at that part. So if you want to play and haven't been tagged yet: Here's an open invitation to you, kind reader, to participate! L=late .. I'm always late. So much so that my best friend in high school wrote out my epitaph: 'Always late, never on time. What she did best - procrastinate.' A horrible habit of mine. Y=yearbook .. When I went to high school I used my stepdad's last name. But when it came time to do my senior year page (yes, we got an entire page to ourselves) I wanted it to say both his name and my father's last name (which was still officially mine). Unfortunately the girl in charge completely forgot to put down either of them. So I'm forever remembered as the girl without a last name. N=night owl .. My favorite time of the day is close to midnight and is usually when I get most of my creative ideas. Daytime is for actualizing them. N=nickname .. Tami is my nickname. My mom called me that the day I was born; however, my name, Tamara Lynn, was picked out for me by my dad even before I was a possibility when he was just a kid in junior high. Speaking of parents, my mom is flying into town for a weekend visit today. She's only been up here once before we moved into our house so I'm getting excited to have her here. USPS says that this little quilt has finally reached its destination to Cher in Oregon so I can show you pictures. Unfortunately they're not good ones, just quick snaps because Steve borrowed my camera. (I'll have to show you later what he needed it for.) 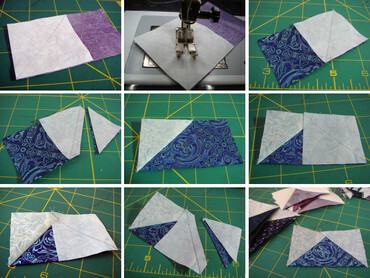 This was my first time experimenting with free-motion quilting using my BSR on the Bernina Aurora. It's fun to use but I think that I need to practice quite a bit with it before I feel confident. I ended up using the walking foot for some more traditional stitch-in-the-ditch around the flying geese. I had a lot of fun designing this and then actually making it. You never know whether the end result will be anything like the initial sketch, but in this case I think it's pretty doggone close. So that makes me happy. Here's a closeup of the button tree. Now that was great fun, digging into my jar of off-white and cream buttons. What do you think, does this make you think winter? My idea of winter isn't usually like this because I'm a California native. We just have a little rain (and mudslides and floods if you're in the LA area.) 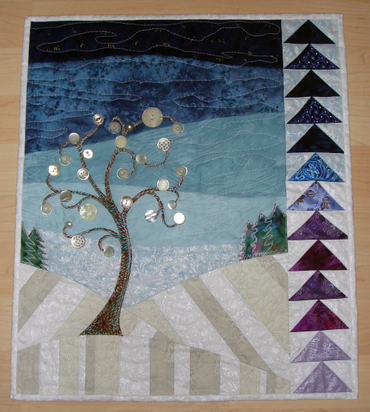 Check out the quilts here on Flickr and links to all the quilters here. 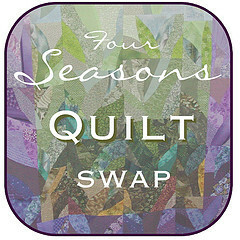 It looks like our talented swap hostess is already working on her quilt for Spring. Thank you Margaret for such a successful swap. I keep forgetting that today's the day for California's vote in the primary. Yes, we're one of the Super Tuesday states. For many years now, Steve and I have been voting via absentee ballots. It makes everything so much easier because we don't have to worry about whether we'll be in town on election day or not. I think that this year's election will be very interesting. I won't reveal who I voted for because the most important goal of today is to get everyone who's 18 and over to vote, to make their voice heard. Isn't that one of the best rights that we have in America? 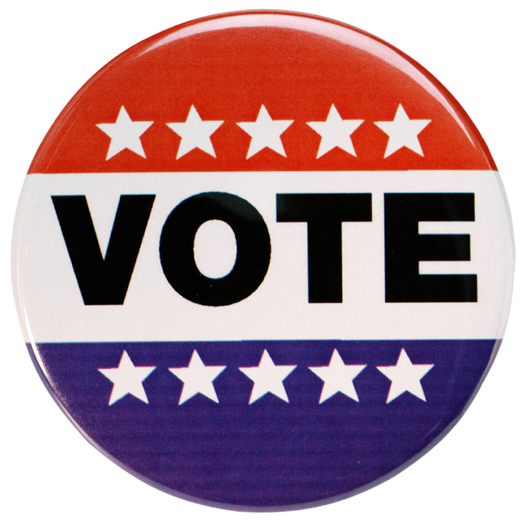 So get out there and vote ... I did! 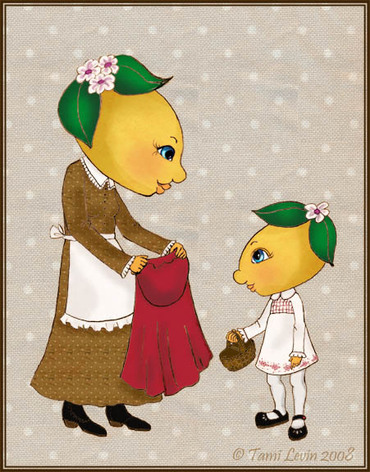 I've been working on a new series of illustrations using the LemonHeads from my banner. The first one is my interpretation of Little Red Riding Hood. Go over to 101 Fairy Lane to check out how the story's progressing along. This was supposed to be in the mail yesterday, but as it turns out I think I may have been a little too ambitious with doing my own design and not a traditional pattern. It'll go out in tomorrow's mail and hopefully my swap partner will think that it's worth the extra couple days wait for it. I won't show the finished quilt until my swap partner receives it, but here's some pictures I snapped while making the top. First I had to make a full-size cartoon of my design. As you can see it was very rough with lots of scribbles and scratches. This was just to get a general idea of scale. I like to use newsprint for this step since it's so inexpensive. 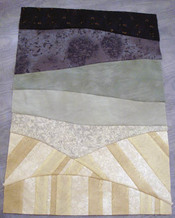 Here's the background with the pieced ground. Hmm, perhaps I could have used more of the pure white for the ground? Cutting this tree wasn't easy at all. I drew it on freezer paper then ironed it onto the fabric's right side. At the same time I ironed on some Misty Fuse to the back. 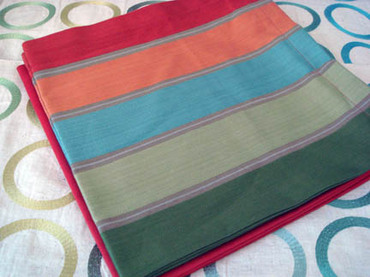 [NOTE: It's much simpler to do this in between two sides of a Teflon pressing sheet. They're available at most quilt shops and is so worth the price.] I found that the small micro tip scissors worked the best for this tiny cutting job. Once that was done I made the flying geese. And as happens in the blog world a lot of the time, only an hour after I worked on my flying geese (and snapping pictures along the way to show you how easy they are to make) I checked my blog feed reader and saw that Kathy of Pink Chalk Studio was making some too! Only she had this nifty little gadget that fits on your sewing machine. Go and check it out here. Since I wasn't making lots of the same ones, I went with the method of cutting rectangles and squares and drawing diagonal pencil lines on the squares. But I may look into the Angler 2 ruler that Kathy showed for later geese production. This should make it to my swap partner by Tuesday so I'll post final pictures once I know that she's received it. I figured that she should be the first one to see it finished. 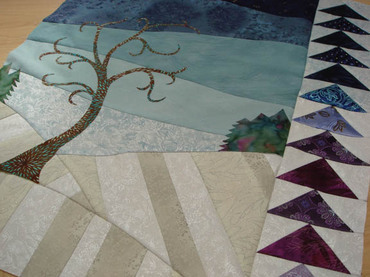 Hmm, after looking at this I realize that I must be pretty fond of Michael Miller's Fairy Frost fabric. I've used three colors here and I used it a couple years ago to make Miss L's birthday dress too.